Newcomers are always welcome. Our services begin at 11:00 AM each Sunday. Attendance might range from 15 people to 50 people. A door greeter will hand you a program and a blank name tag and ask your name and where you are from. Most people will be wearing name tags so you can tell who they are. We like to introduce newcomers at the beginning of the service if you wish. The dress code is relaxed: you may see casual wear and formal at the same service. Come as you are! Children may stay with their parents or they may join the other children in the supervised childcare and religious education in the back of the building when the congregation sings them to religious education. The service leader guides us through the hour. He or she begins with the Chalice Lighting, which consists of lighting a candle and reading a poem or passage with an inspirational thought. This is followed by Joys and Concerns, in which members of the congregation are invited to share that which has touched them in the past week. 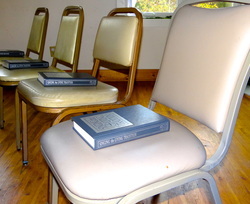 Music for the service involves the entire congregation singing from a hymnal, usually with instrumental accompaniment. The service leader will ask the congregation to stand for songs as they are willing and able in body or spirit. A collection plate is passed so that the members can contribute financially to the work of the congregation. The message of the hour will be conducted by a member of the congregation, a visiting Unitarian Universalist minister, a speaker from our community, or a visitor from further afield. The message may be one of social activism, cultural or environmental awareness, artistic inspiration, a spiritual journey, or a moral teaching from the perspective of a major (or minor) religion. We hope that you will be challenged and uplifted by the message. At the conclusion of the service, it is our tradition to join hands in a circle around the edge of the hall and say: "Go in peace, believe in peace, create peace." We encourage you to stay for coffee and conversation afterward. If you have any questions about anything you see or hear during your visit, do not hesitate to ask any of the members.